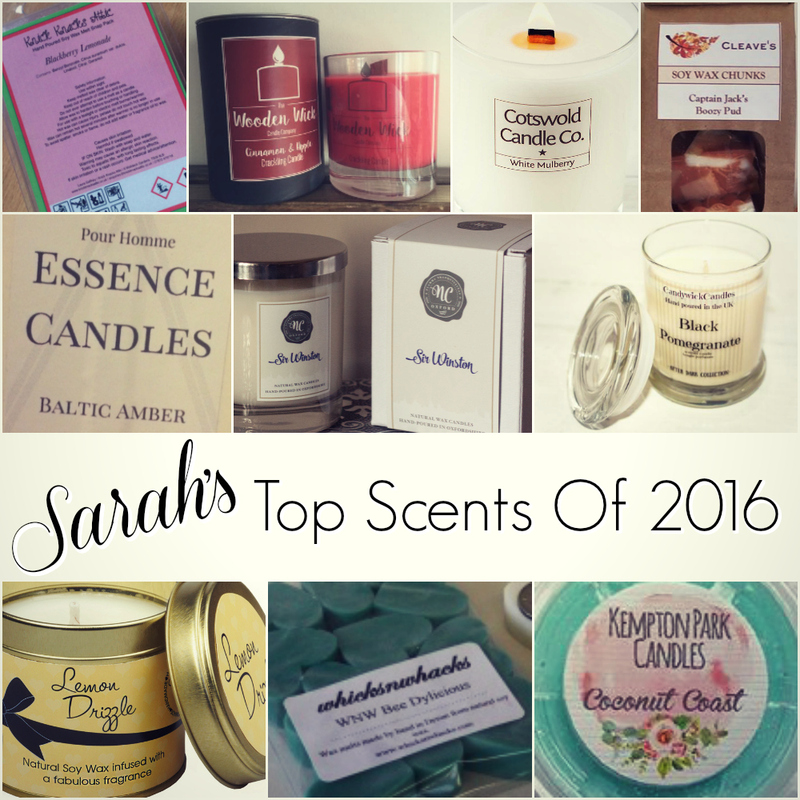 2016 has been another truly wonderful year for the two of us and we’ve been blessed to work with so many amazing brands and been ever so lucky to review so many great products; so we thought it would be fun if we each shared our Top Scents of 2016 lists with you. It was ever so tough for us both to just pick ten scents each because there are so many great candle artists and creative geniuses out there. Bunny Kisses by Flamingo Candles – This was a limited edition Easter scent from Flamingo Candles but I stocked up on it, so I have a stash to last me till next Easter; it started a rhubarb addiction for me. Bunny Kisses is quite similar to rhubarb and custard sweets only fancier and more grown up, maybe more like a decadent rhubarb crumble with a rich, creamy vanilla custard. Mrs Potts by My Dearly Loved – This is on my top scents list for the second year in a row, I would literally go nuts without Mrs Potts. This fragrance is freshly brewed blackberry tea. It’s a wonderfully soothing aroma with its combination of sweet blackberries, earthy tea leaves and I can smell a touch of citrus zest as well. I’ve tried and reviewed many scents from My Dearly Loved and I’ve honestly loved them all, everything Lyn makes is second to none, but Mrs. Potts is my go-to calming and de-stressing scent, it’s ever so comforting. Hot Maple Toddy by Candleberry from Clouds – I knew as soon as I took the lid off my candle, the first time I tried this, that I was in for a treat. This is a really complex, unique and delectable scent. I’m not generally a fan or honey or honey scents but with Hot Maple Toddy, it smells more like maple syrup, which I love, with citrus notes from the lemon element, a dash of spices and I’m pretty sure I can detect some booziness in it, which is always good! I recently ordered another one of these because I love it so much. Spring Kitchen by Esscentual Candles – Spring Kitchen is described as a blend of Coffee, Shortbread and Orange, yum! The scents are three very simple and everyday aromas, but when they’re combined it makes such a unique fragrance; a little bit sweet, very creamy and kinda spicy. It was really comforting and warming too, perfect for the colder evenings. Rhubarb & Sicilian Lemon by The Bronte Candle Company – This scent is a refreshing blend of juicy, tart rhubarb and sharp, zesty Sicilian lemons. It’s just insanely good, so full of zing and very uplifting. Oud Royale by Colton Candles – This scent overall is quite fruity but it has some deep, masculine notes too and a hint of sweetness. It really unique and such a luxurious aroma. I’ve never smelled anything like Oud Royale before, I think that’s why I love it so much. Colton Candles really knocked it out of the park with this scent. Love Spell by Vix Wix Wax Melts – Vix Wix describe Love Spell as “cheeky cherry, apple and peaches” but I think there’s so much more too it. You can definitely spell the juicy peach element, but I can detect a medley of various fruits and berries, like zesty orange, tart raspberry, sweet strawberry as well as some vanilla and musk elements too. I’ve had this type of scent in products before but the reason this particular one is on my list is because it’s a little different, a really complex and feminine fragrance. Plus just jam packed with fragrance, Vix Wix melts are just jam packed with fragrance, it’s crazy, I got easily 20 hours (5 regular tealights) worth of scent out of one cube! That definitely makes this one a winner for me. Sparkling Amethyst by PartyLite – I am OBSESSED with this scent, I just can’t get over how fab it is. The raspberry adds a tart element to it, the plum and fig make it really sweet and juicy and the tobacco element makes it sort of musky and spicy, like a mandle. Cream Soda by Maddison’s Melts – This smells just like good old fashioned cream soda, notes of caramelized sugar and rich vanilla and you can smell the fizziness too, this scent has a sort of effervescence to it. It’s crazy good. Campfires & Summer Camp by Banter & Bliss – I’m always on the look out for super unique scents; scents that you wouldn’t see that often and ones that are wacky combinations of fragrances, and this scent is all that and MORE! The best way I can think to describe this scent is, imagine a rustic campfire and that amazing wood smoke aroma, then start roasting delicious, creamy vanilla marshmallows on it to make s’mores, but instead of the traditional chocolate used in s’mores, you pile on lashings of sweet, juicy raspberry jam. YUM! Blackberry Lemonade by Knick Knacks Attic – Sparkling fruity scents are always a winner with me. I’ve loved SO many of the wax products from Knick Knacks Attic and this year I’ve tried out their bath bombs. Another winner! Cinnamon & Apple by Wooden Wick Candle Company – I do love a wooden wick and cinnamon and apple is such a winning combination for me. I loved how amazing the throw was on this and they are such a great price too! Want to add more to my collection in 2017, I’m starting a list! White Mulberry by Cotswold Candle Company – Probably one of the surprises of the year for me, I wasn’t totally sure I’d like it but it was such a great scent. Sometimes the surprise scents are the best. Baltic Amber by Essence Candles – I’ve really loved Amber this year (and pomegranate and mandles) but this was one of the first real introductions in 2016. I absolutely loved everything about it. Loved their Pour Homme collection! Black Pomegranate by Candywick – Along with amber and mandle scents this year, I also had a pomegranate phase that rolled over from 2015. Candywick’s Black Pomegranate reignited this phase again. Superb! Lemon Drizzle by Kiss Air Candles – Om nom nom! This is a super bakery scent and one that I really love for the zesty lemon too. I need to stock up again for 2017! Bee Dylicious by Whicks N Whacks – My favourite fragrance for a long time has been Be Delicious by DKNY and finding out it could be made into wax form was a real win for me this year. It really brought a new aspect to the scent I have loved and continue to do so! I love that this company take requests for scents too. One of my “I wonder if they have” websites. Also highly recommend them if you’re making candles/wax products too as they have everything you need. Coconut Coast by Kempton Park Candles – This was perfect in the summer, I find coconut is such an all year round favourite but I really loved the fruity elements to this. It made it more like a coconut cocktail. So good! 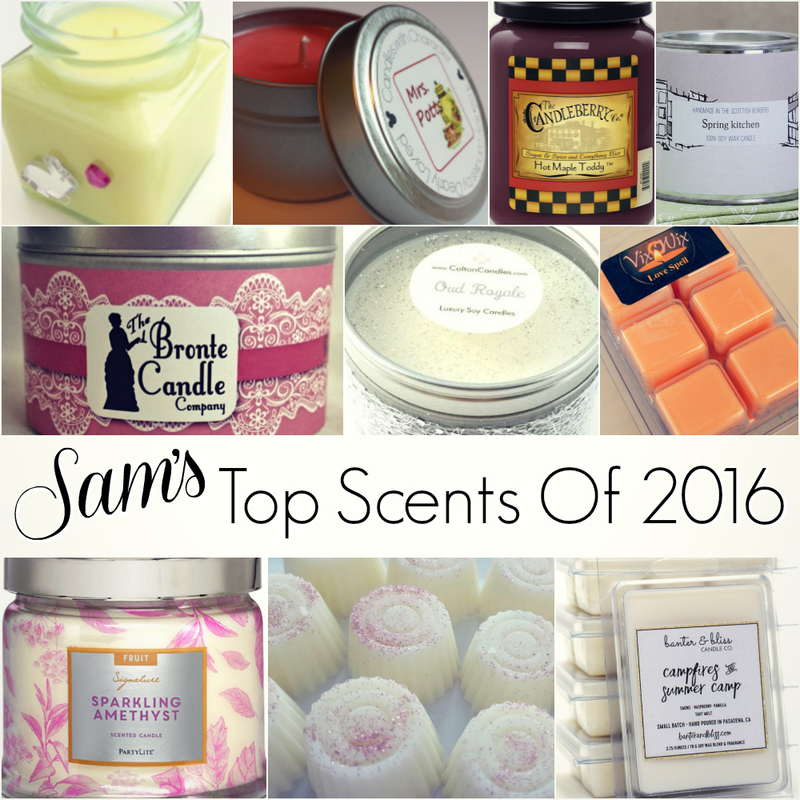 So what scents have you been loving this year? Let us know in a comment below.